Too many books on your hands? or too many just sitting on your floor? Hang ‘em up! 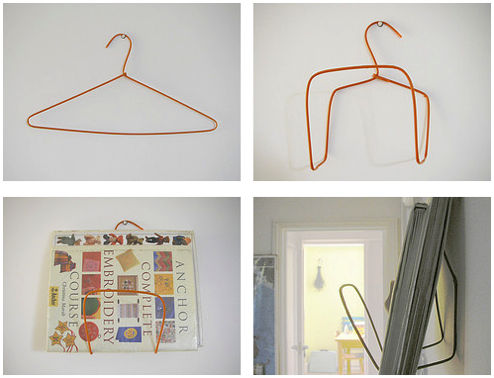 You can make a book rack out of a cheap wire hanger–yes, a wire hanger. Basically, you’re turning a triangle into a rectangle with a few well placed bends. 1. Start with the legs of the wire hanger’s triangle. Bend midway through each leg. 2. Pull down on the base to stretch it out. Straighten out the sides and bend two new corners into the base. 3. Fold the wire hanger in half (think hamburger, not hot dog), making sure to leave enough room at the bend to hold your book. All that’s left is to hammer in a nail and hang your rack. Voila! You’re a cheap, er, economical college student. Awesome! I got to this post from SFist, and I’m totally going to use this to make displays in my underfunded school library. Thank you!! this seriously made my desk area so much more convenient! Could be uncommon to locate skilled individuals with this issue, even so, anyone sound like a person understand just what you might be posting concerning! Thx. comprehensive info a person present. It’s wonderful to come across a new weblog each every now and then that isn’t the same kind of rehashed substance. Amazing examine! I’ve preserved your internet site as well as I’m including your RSS rss feeds to our Google consideration. hi, exceptional site, as well as an excellent realize! just one regarding my favorites.